Finally sewed up the hat that I knit when I was at home in Wexford. 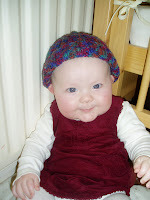 It fits Smem really well and she looks so cute so thought I would share the pattern. It can be worn with the point up, which makes it look like a pixie hat, or..
you can turn over a brim at the bottom and wear it like a beanie. Very versatile! I used size 4mm needles and dk yarn. You will need a darning needle to sew it up. 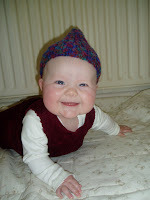 The hat will stretch to fit my head, so size wise I would put it at 6 months and upwards, just lenghten the ribbing for bigger heads. Work K2,P2 rib for 4 inches. Row 1: (K8, K2tog) to end - 90 sts. Row 3: (K7, K2tog) to end - 80 sts. Row 5: (K6, K2tog) to end - 70 sts. Row 7: (K5, K2tog) to end - 60 sts. Row 9: (K4, K2tog) to end - 50 sts. Row 11: (K3, K2tog) to end - 40 sts. Row 13: (K2, K2tog) to end - 30 sts. Row 15: (K1, K2tog) to end - 20 sts. Row 17: (K2tog) to end - 10 sts. 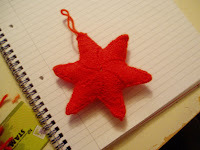 Break off long length of yarn, thread through remaining stitches and pull up tightly. Join side seam and weave in ends of yarn. And now a final 'arty' shot from my photo-shoot with Smem. Hi, I found your pattern on Ravelry as well. I've casted on, and I am at the beginning of the decreases. When you say to continue the second row in pattern, I am not sure if I should knit the same as the stitch below, or continue as k2p2. I suppose I could just give it a whirl, but I'd love to know how you suggest to do it! :) Thanks! 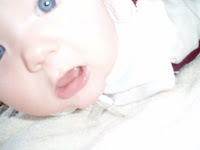 First, I'd like to say, nice pattern ad baby pics. She's cute! I appreciate straight needle patterns s I am a disabled knitter and cannot use circular needles. I just wondered what is dk yarn? and do you have a gauge to go with this pattern? Thanks. 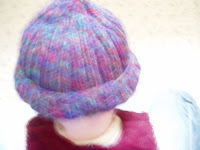 Thank you for sharing this sweet baby pixie hat. Love it!